Today was our day to explore San Antonio. We had a few things we knew we wanted to do, and had to be done by 6pm for our final planned event for the trip, so after a quick brekky we got out into San Antonio. Sadly the freezing cold was replaced with pretty cold and drizzle. But that didn’t stop us… we just popped the rain jackets on and hit the streets. First destination was the main reason many people come to San Antonio, to visit the famous Alamo, site of the main battles in the independence of Texas. Located in the heart of San Antonio, it is quite strange to be wandering downtown and then come across some old 1800’s Spanish/Mexican/Texan ruins. It is a National Monument, so it is free to wander into, so in we went. The site itself is quite small and there is actually not too much to see. 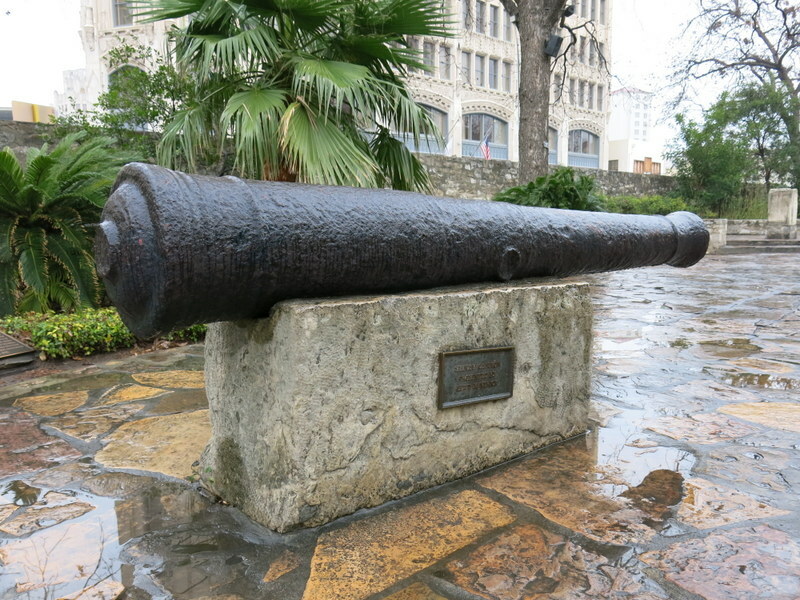 The site is one of the main Spanish Missions located in San Antonio (one of 5 that can be visited) but happened to be the location of the historic battle, leading to its significance. 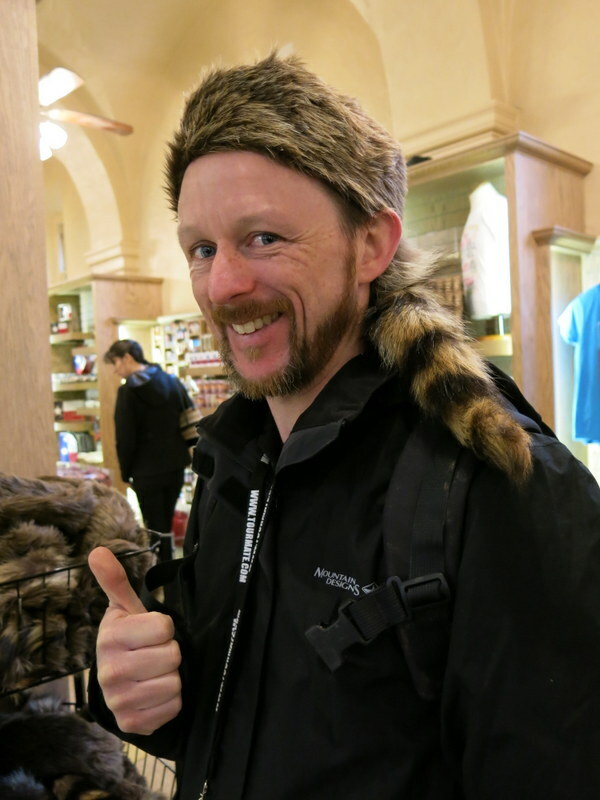 It was cool to wander around and learn more about the history of Texas, however we were done quite quickly. As we were downtown, we decided to explore the Riverwalk a bit more. It was quite nice to wander along the river, checking out the stores and restaurants. It all seemed a bit early though as there were few people about, and since it wasn’t yet eating time we moved along quite quickly. 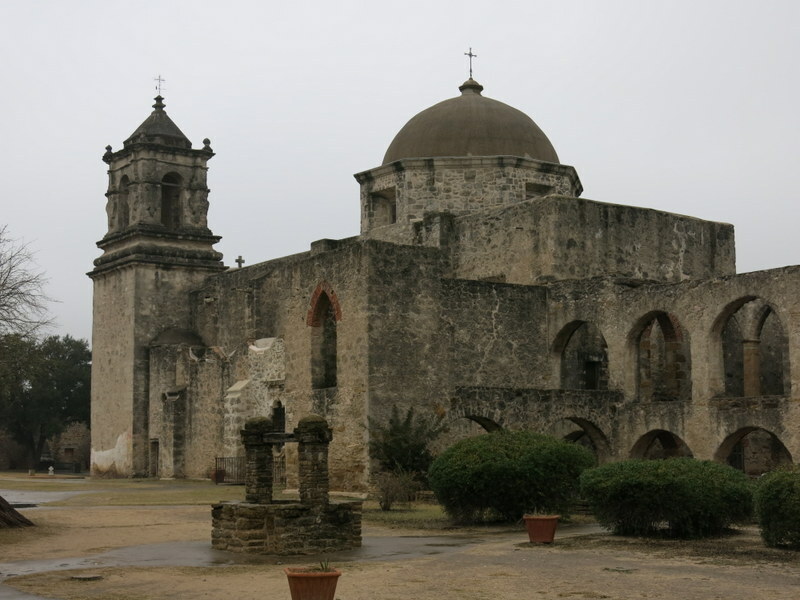 As we had gotten a taste of the Spanish Missions, we decided to jump in the car and head out on the “Mission Trail”… the circuit you can do to check out the other 4 Missions that are located in San Antonio. So off we went! San Antonio is indeed a strange city. As we headed south, the city seemed to become sparsely populated really quickly. The weirded us out a bit given San Antonio is the 7th biggest city in the US. It must be more populated out in the other directions. Anyway, after some twists and turns we arrived at our next “mission”, Mission San Jose. This is the most complete (and restored) of the bunch. Given the rain, and the general low tourist time, there was hardly anyone else about. Like the Alamo, the site is quite small, but it was nice to wander in the grounds and check it all out. Now Kate was on a real mission (enough of the mission comments! )… she wanted to check them all out. So back in the car and armed with a tourist map, we headed to the next, Mission San Juan. This was the smallest of the lot and didn’t offer too much to see. But we jumped out of the car into the rain enough for a quick pic, and then off we went again. Next up was Mission Espada. This had a bit more happening, but was still quite small. But it was fun cruising around San Antonio, checking out the old ruins dotted about the city. Final one on the list was Mission Concepcion. These ruins were in some respects the most complete from the original building. Like the first couple, we could wander in the buildings and in the church and soak it all up. So that was mission complete! With that we decided it was time for a late lunch / early dinner. We were up for burgers, so smashed some down. But what we really wanted was some Ben and Jerrys. Kate’s radar was on and we located the only scoop shop in town. What was funny was that given the cold weather we were the only customers for the day! My main goal was to sample the new limited Anchorman flavour, i.e Scotchy Scotch Scotch. And boy was it butterscotchy! Sadly I didn’t get a pint to see Ron Burgandy’s face staring at me. I topped it off with another new flavour, Candy Bar Pie, which had peanut butter and chocolate covered pretzels in it. This was the king… it was so tasty. I didn’t care that it was about 6 degrees. Bellies full it was time to head to our evenings activity… NBA! 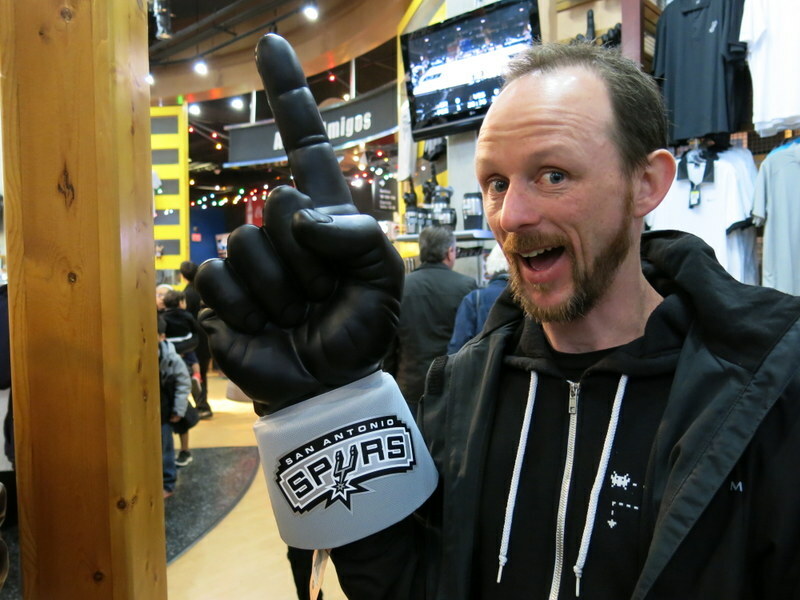 We had organised tickets to see the San Antonio Spurs v Dallas Mavericks before we came. I was super buzzed to see some NBA again, about 15 years since I had last seen it. The atmosphere was great once the stadium filled up. The NBA sure knows how to get it happening. The game itself was good, but the Spurs owned it from the opening minutes and it was never close. However it was cool to see some of the (now) classic players like Tim Duncan and Tony Parker on the court. We even got to see Australia’s own Patty Mills! And watching the crowd loving him was great to see.